Towards the end of the Ruthless Aggression era, WWE began releasing a series of DVDs known as Live In The UK to - yes! - the UK market. These DVDs consisted of the main roster television episodes from a specific UK tour, so for instance the first such release was based on the October 2007 UK tour. (There was a prior Live In Italy DVD from the April 2007 tour of that country, which was the blueprint for the UK version). I will review these DVDs not only to judge whether they're worth owning, but also to identify just how much the WWE product has changed over the last few years, using these releases as a history tool. And believe me, a lot has changed in WWE since autumn 2007, even if certain elements of Raw and SmackDown would make you think otherwise. Incidentally, I am not reviewing these match-by-match because, between the short bouts and backstage segments, there would be far too much to break down; therefore, I will just point out notable aspects, for better or for worse. So, beginning with the October 2007 DVD: at this point, WWE was only just beginning to show signs of rebounding from the horrendous Benoit Tragedy of June 2007 and the injury jinx which had hindered the roster for much of the year. In fact, John Cena had been injured right before the tour, and in response, Shawn Michaels was brought back from his own injury lay-off on the episode of Raw before this tour kicked off. Fortunately, other stars (such as The Undertaker) had also returned, and come early 2008, the spate of injuries would be a thing of the past, not being a mass plague again until late 2015/early 2016. I should also point out that, at this point, we were well into the brand extension era, as we still had separate rosters for Raw, SmackDown and ECW, although the third brand was now ECW in name only and had already been portrayed as the read-headed stepchild to the Monday and Friday night broadcasts. With Cyber Sunday approaching (which to me was the first of what would be a string of really good or excellent PPV events, stretching right through to 2009), the focus for this week of television was to promote that interactive PPV. To that end, Raw saw WWE Champion Randy Orton face all three of his potential opponents - Jeff Hardy, Mr. Kennedy and Shawn Michaels - in response to insulting England, the home country (of course) of Raw General Manager William Regal. Vince McMahon also promoted Triple H's bout with Umaga by putting the Samoan Bulldozer against a jobber in three different stipulation matches (Street Fight, Steel Cage and First Blood), based on what the CS match could have been, although HHH does not appear on the show (that being said, he did appear after the televised portion ended to fight and beat Umaga in a very good Street Fight; I know because I was there). Oh, and there are shenanigans involving Jonathan Coachman and Hornswoggle, who had recently been revealed as Vince McMahon's illegitimate son. You read that right. SmackDown also built towards the Batista-Undertaker match for the World Heavyweight Title, with JBL campaigning to referee said match (his opposition Mick Foley and Steve Austin did not make similar cameos). In the ring, though, the greater focus was on the Matt Hardy-MVP and Rey Mysterio-Finlay feuds, with Matt facing Finlay and MVP battling Rey. Also, Kane had a run-in with the terrible combo of The Great Khali and Big Daddy V, and Drew McIntyre made his debut wearing a kilt. Drew's forgotten first run on SmackDown quickly ended and he went back to developmental, before a much more successful tenure upon his 2009 reappearance. As for ECW: John Morrison fought The Miz as both (and Big Daddy V) vied to face CM Punk for the ECW Title at Cyber Sunday. The shows are almost all filler, especially Raw; besides Matt vs. Finlay and Rey vs. MVP, they are all mediocre at best and phoned-in at worst. There's nothing offensive here, but it says a lot that the best parts about the Raw taping were the Hornswoggle-Coach angles and the non-televised HHH-Umaga bout. It's good to see the stars of the era, and to hark back to a time when Batista was actually really popular, but the shows themselves are fairly missable. Only SmackDown really measures up to a US taping of main roster WWE television from the era, and even that is only mildly entertaining. The DVD does include the fabulous Cena-Michaels match from London in April of that year as an extra, along with selected clips of the tour . However, I have to mention one very big negative about this DVD, something which I had never seen on a WWE DVD before. This was still the TV-14 era, although the general content of the product had felt toned-down since around May 2007 (prior to the Benoit incidents, despite what some will tell you). WWE would still deliver blood and violence when it was deemed appropriate, though, such as an angle from the October 8 2007 Raw (the week before the tour) where HHH took weapon blows and bled, albeit not to a particularly brutal degree. Here's the issue: this DVD must have directly broadcast the versions shown on Sky Sports, and in the morning or afternoon slots at that, because the weapon shots aren't shown! Amazingly, the screen freezes before weapon shots, on an official WWE DVD! Why would anybody want to watch versions of the shows which have been edited to this degree? I can understand doing so for the broadcasts during child-friendly hours on TV, but not on a proper DVD. Mind-blowing. In case you haven't noticed, I wouldn't recommend this DVD at all. The best match on the release can be found on other DVDs, and the best match from the tour under scrutiny isn't included, because it was non-televised. None of the remaining content is worth parting with your money for, and if you wait a couple of months, chances are that these episodes will end up on the Network anyway. Even if they were, the edits of weapon blows tarnish the presentation of the DVD greatly. So, unless you see this DVD pop up in Poundland, don't buy this DVD. 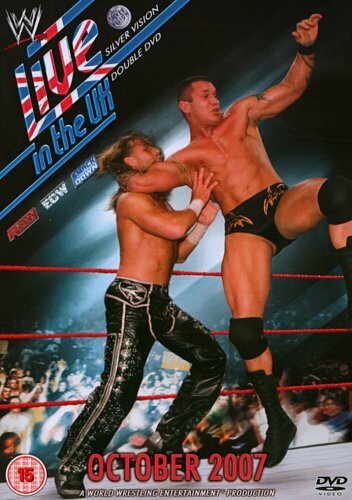 It's safe to say that things aren't off to a great start for the Live In The UK series, and that even the most frustrating aspects of WWE television today are still superior to much of the WWE product as of October 2007. Fortunately, things would improve in late 2007/early 2008, but these particular episodes are far from must-see. Only if you are an avid collector should you buy this release.